Is there anything more delicious than homemade apple tart with a hint of cinnamon, sweet raspberries and golden, buttery pastry? This tart is fairly simple to cook and because we know how tempting it can be to use store- bought pastry, we have made sure this pastry recipe is super simple to make. Heat oven to 180 degrees Celcius (350 Fahrenheit). To make pastry rub butter in to flour, sugar and salt until large crumbs form. Sprinkle with chilled water and mix in to a rough dough. Transfer to a floured board and knead for about 2-3 minutes. Roll out flat in to a circle shape approximately 16 inches in diameter and 1/4 inch thick. Lay pastry flat on a sheet of baking paper. To make filling core and chop apples and add to a saucepan with two tablespoons of water, 1 tablespoon of sugar and cinnamon. Cook on low heat until apples start to soften. Remove from heat. Spoon apricot jam on to base of pastry in a circle leaving about 2 inches around the diameter. 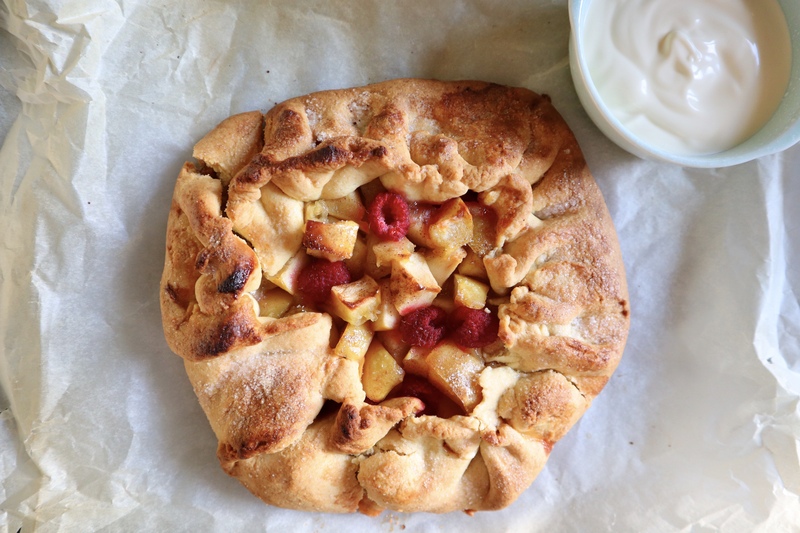 Top with apples and fresh raspberries and fold sides in to make the tart case. Brush edgeswith milk and sprinkle remaining sugar on top and bake for about 50-55 minutes until the edges are golden and the apple mix is bubbling. Remove from oven and slice, serve with a spoonful of fresh double cream. Enjoy! Want more tart recipes? Click here for a delicious savoury Rustic Tomato Tart. They both sound delicious! How good is it when the kitchen smells of cinnamon and apple and spice..